I have never said Roon shouldn’t incorporate Qobuz. I said it doesn’t matter to some of us because we will never have access to Qobuz, and the list of those without access spans 185 countries. I said in an earlier post that I think Deezer is a better alternative. I’m also not among the Tidal doomsayers, so I don’t expect it to disappear any time soon. It’s the overall view of the customer base that is important. The combined voice of the customer. The community here is a very good way of judging and a fairly basic look at this site tells you that Qobuz would be high on the priority list. I’d suggest Roon has a fairly decent following in the UK…it’s seems to be quite popular, funnily enough, in similar countries to Qobuz… India and China… not so much. Actually, I think internet forums are a very poor way to judge anything. They’re often populated by a small, vocal segment of a customer base while the rest remain silent or seldom post. The loudest voice doesn’t necessarily speak for all. In any event, I’m a big fan of Roon. I won’t benefit from Qobuz and I suspect many won’t pay to use it because it is expensive. It’s a big world, and Roon would have a great deal of potential if it explored more of that world. For all I know, it is. I have no idea whether Roon has a large UK customer base, and I don’t think anyone but Roon does. You seem to know much more about where Roon’s customers and potential customer are than I, so I’ll defer to your considerable expertise. However, I have seen no facts in this discussion. All this reminds me of this IBM marketing guy who wanted us to put some features in our software that would support a piece of hardware they were selling. There’s no demand for it, I said. He told me a story about a city transit authority that was thinking about putting a train station at a new location. They hired a consultant to do a study. I can’t help but feel that Tidal and Qobuz try to address different groups, Tidal is more the rock/pop orientated, from rap/hiphop all the way to punkrock/alternative with loads of rock & pop between whereas Qobuz is a little more on the classical and jazzy side of things. in any case, my point remains it’s a great pity (for me) Roon doesn’t incorporate Qobuz, and I’m looking forward to when it does. Why is it so difficult to make all customers happy? Just do both and it’s good! Fortunately I only have a 1 year license from Roon. 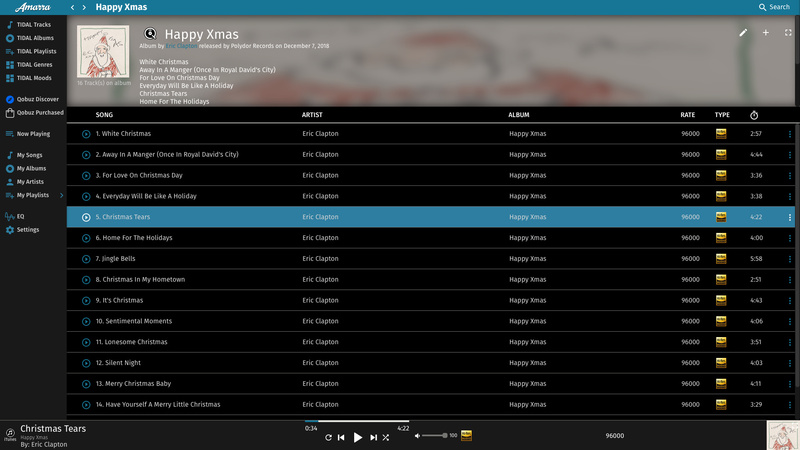 I’m still using Audirvana 3.1 with Qobuz and Tidal. I also have the SoTm sms200 NEO via OPPO UDP 205 with SqueezLite and both work without the bitching of Roon. Sorry but these eternal discussions don’t lead to anything. If Qobuz is coming to Roon, then I use both Tidal and Qobuz, I mean, come on… little more than 45 Euro per month for millions and millions of music cd’s. Wise man. i’ll do just that and live a happier life! Most people I have talked to that have used both say Qobuz , comparing apples to apples,has the better audio quality. I’m interested in finding out myself early next year. You’ll find poor ones on both. Especially if you want to listen to a specific album only available in HiFi but HiRes. Looks to me as if widening their coverage at all costs was done. +1 here. Then, after living with both of them for a while, I’ll be in a position to choose one over the other–or not and keep them both. It’s not that big an outlay for all that music. Okay, my Cedia2018 “qobuz society” streaming rights just expired, and I have received an e-mail to get a subscription. However, I am living in the USA, and I know Qobuz USA has still not been launched yet, so will I really be allowed to buy a subscription now, from the US? Or should I wait until Qobuz USA is launched before getting on-board? Now when i go to the cite, it behaves as if I can buy a subscription, but prices are stated in pounds sterling, and the site address appears to be GB (Great Britain), so I have not really attempted to buy the prescription. What does one normally do under these circumstances? Qobuz Hi Res streaming in 24/96 works fine. Yeah, but do they have any hardware and crestron control? In all seriousness - I hope when Roon does integrate Qobuz, it’s better than either Amarra or Audivarna implementations. I am sure they can do it better. I am hoping for a MUSIC search first and foremost and then versions highlighted from different streaming services. Making the streaming service top of the search tree is, well, naff. It’s just a win for all of us if music software and streaming services are being integrated as a general matter. Means we have choices and backup plans! Forgive this technical Streaming101 question: “Hi Rez” says up to 24/192 quality. But Qobuz plays through Macs on Airplay which I believe is 24/96. And it also recognized UpnP which is anathema to Roon for the lack of clock control. So if or when Qobuz talks to Roon, how will it do so? Also, if one downloads a Qobuz “hi Res” album, will Roon display it as being 24/192? Play it as such? Sorry, but all the dueling bits and clocks confuse. Unfortunately, @James_I, I also believe that all this integration will serve to dilute the programming talent dedicated to any one stream.